French oil producer Maurel & Prom has signed a Tanzania gas sales and purchase agreement alongside Wentworth and the Tanzania Petroleum Development Corporation (TPDC) that will facilitate the sale of natural gas from the Mnazi Bay and Msimbati fields to a 532 km government-owned pipeline scheduled to launch in 2015. The deal is expected to help double the power generation capacity of the country to 3,000 megawatts by 2016. According to Bob McBean, executive chairman for Wentworth Resources, the newly signed agreement represents existing advancements in the gas industry as well as opportunities for future growth. “The signing of the Mnazi Bay gas supply agreement is a significant advancement in the development of the gas industry and lays the foundation for the future domestic gas development in Tanzania,” he said in a recently released statement. Based on the agreement, the Mnazi Bay Partners will supply the Pipeline Project with a maximum of 80 million cubic feet of natural gas per day during the first eight months with the option to increase to 130 million cubic feet of natural gas per day for the duration of the 17-year supply period. 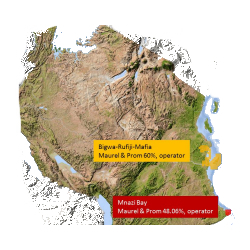 In 2009, the Maurel & Prom Group acquired the production permit for Mnazi Bay and now holds a 48.06% participating interest in production operations with the remaining 31.94% and 20% participating interests held by Wentworth and the TPDC respectively.